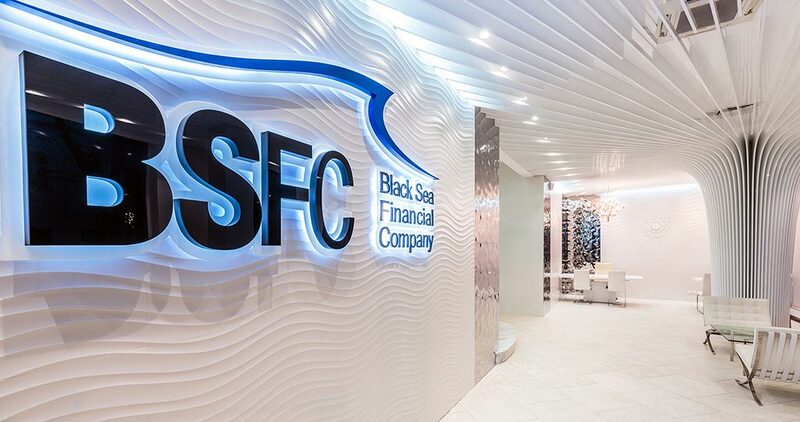 Entering the new offices of the Black Sea Financial Company (BSFC) is like going deep into a new dimension. 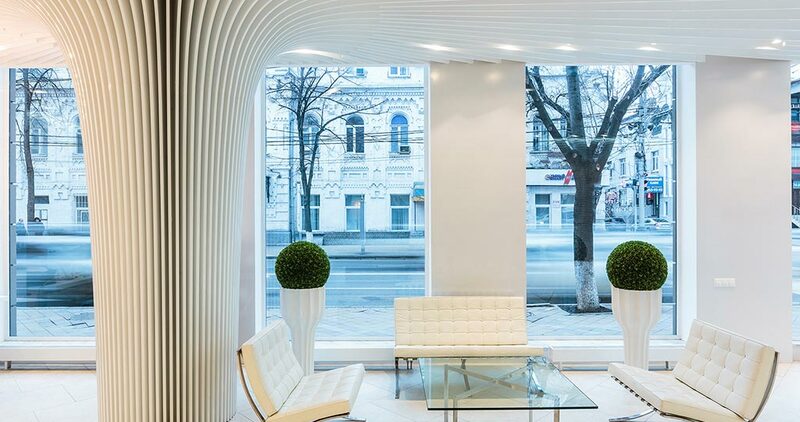 Future-styled and with dynamic lively lines, this project carried out by the Bon Ton studio in the historic centre of Krasnodar, in Russia, impresses because of its uniqueness and beauty. 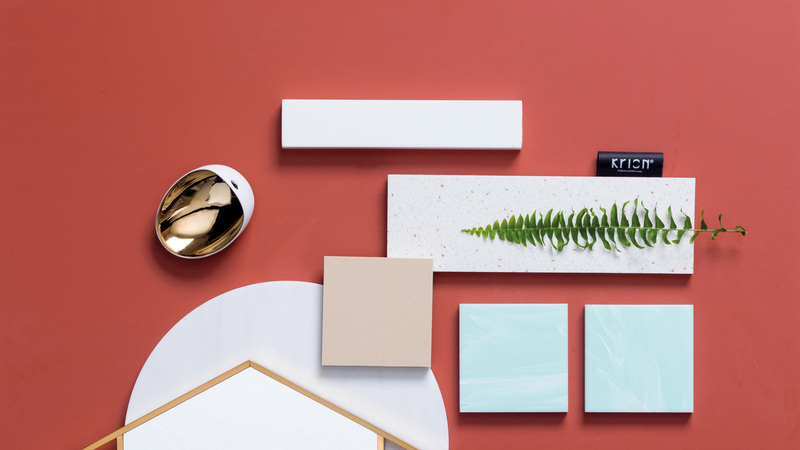 An interior design is expected to offer brightness and spaciousness, strongly and clearly conveying the corporate values of the brand to the client. 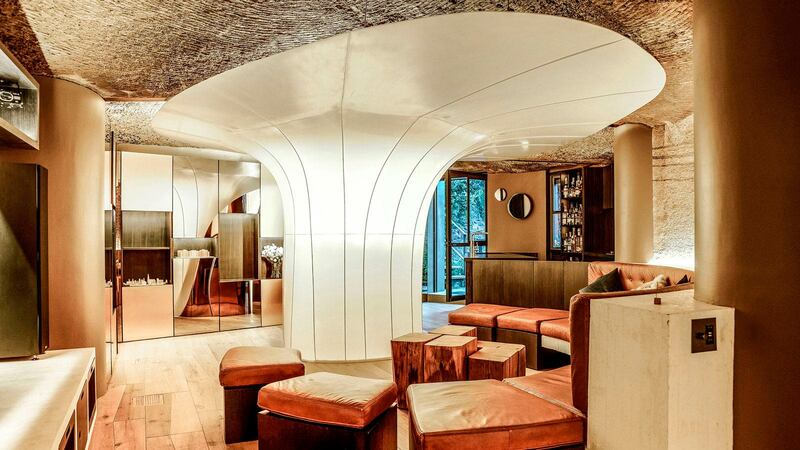 To achieve this, the architect, Alexandr Andréevich, has banked on the quality and exclusivity of the materials from the PORCELANOSA Grupo, which have completed this highly-contemporary interior design challenge. In this regard, it is worth highlighting the ceramic wall tiles by Porcelanosa and Venis: Qatar Nacar and Seul Nacar from Porcelanosa and Sea Silver from Venis; the latter in a silver colour and a metal finish, therefore, providing an outstanding optical illusion. 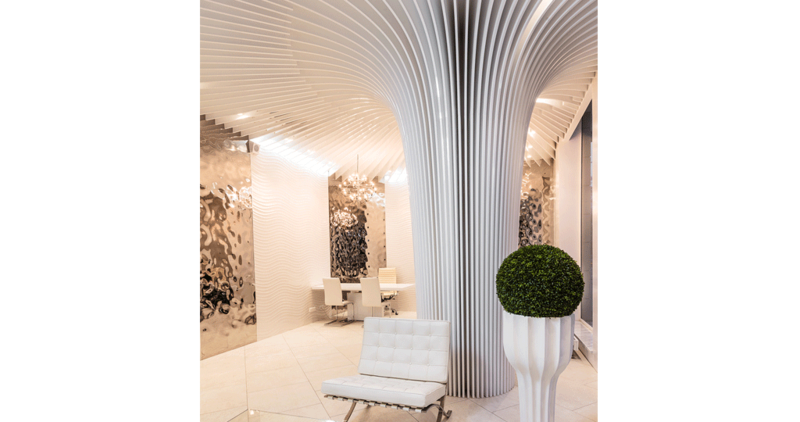 Additionally, the KRION® Solid Surface mineral compact is also highlighted, since it has been used for both the decorative structure of the ceiling and the central column shape. To carry out this project, it was necessary to design two areas: a front-office and a back-office. An interior design whose main intention is to represent the corporate values of the BSFC, as it was required by the company. More generally, the project is in a six-storey building made of reinforced concrete, a terrace and basements. Regarding the theme that the interior design was about, it would be that which represents the name of the Financial Company itself, with continuous references to the sea, water, the time, vitality and dynamism. 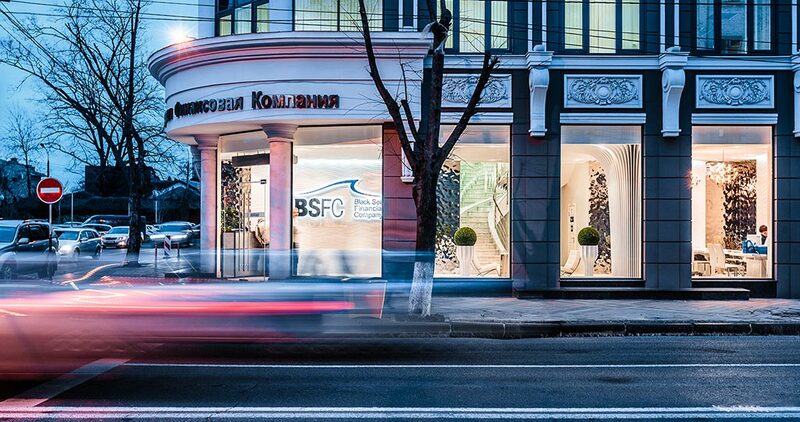 The main space in the new BSFC offices in Krasnodar is aimed at customer service which responds to the services offered by the consultancy. 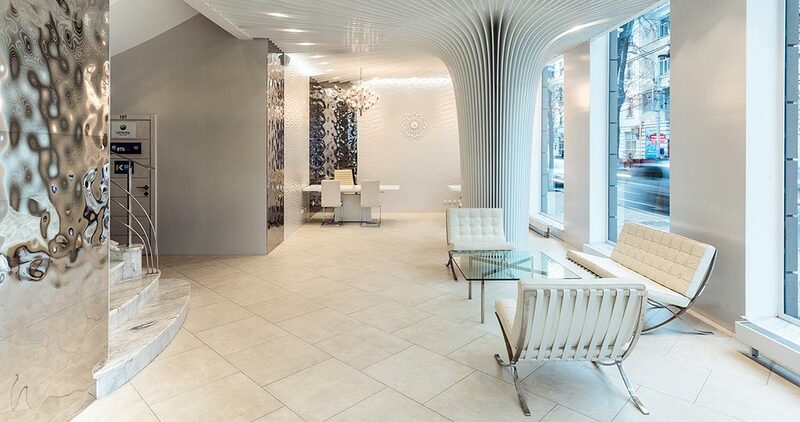 It is a public area based on an interior space facing outwards, with large glazed windows, and the most exclusive materials, such as the Sea Silver wall tile by Venis, inspired by water movement, sparkling brightly with a wavy texture. The lighting, for its part, is divided into three parts, with every single interior design item being highlighted: a zenithal light in a neutral colour, cold-tone LED-lighting to enhance the walls, and warm-light chandeliers to highlight the desks. One of the other main items regarding the interior design is the central column on the ground floor. A concrete component that should be hidden because of the strong visual presence that accumulates in the interior space. 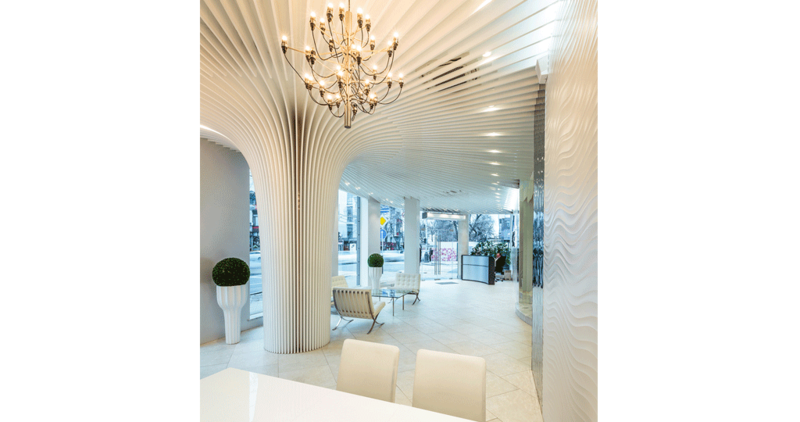 For that purpose, the decorative column covered with the KRION® Solid Surface has been joined to the ceiling. 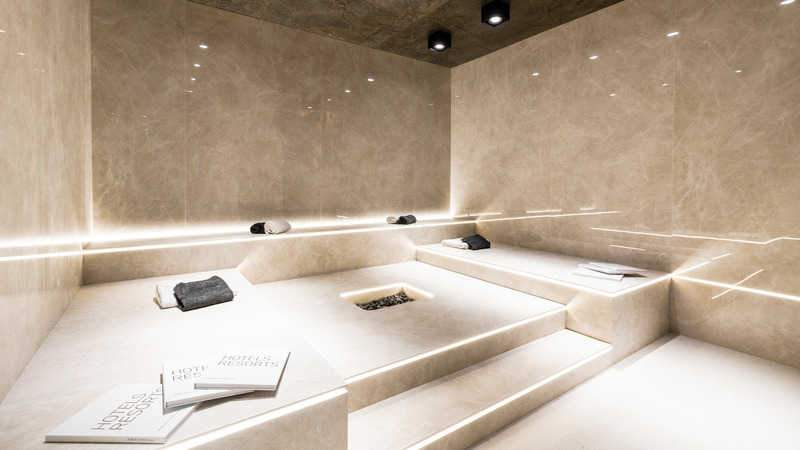 The acrylic stone from the PORCELANOSA Grupo results in being ideal for this purpose, thanks to its thermo-curving properties, with the soft lines arranged to provide the space with character. Regarding the first floor, the sales department and the meeting room are located there. In the interior of the second and the rest of the floors, a glass partition system has been used, with channels for the cables. In conclusion, the new BSFC offices in Krasnodar is a project which benefits from the quality and easy-maintenance properties of the materials from the PORCELANOSA Grupo, giving a free rein to the designer’s imagination while staying true to the corporate values of the company.